As a cultural institution, prom has been a part of the American tradition in one form or another for the better part of the last century. In small towns and big cities alike, young men and women attend their prom as a marker of the accomplishment of having finished high school and fulfillment of the tradition so often represented in television and media. 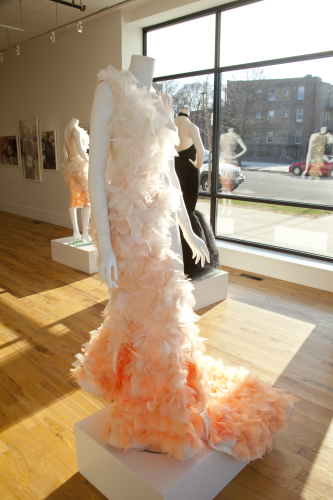 In the last few decades, however, prom has become far more than a school dance; the current exhibit at the Arts Incubator in Washington Park, Runway to Reality, explores the pageantry and extravagance of prom on the South Side through the sociological photography of Helen Maurene Cooper and the fashion designs of Suzette Opara. The collaboration between the two seems like a perfect fit: Opara, whose one-of-a-kind, custom-made gowns are in high demand every prom season, has given Cooper exclusive access to the hours-long process young women and their families undergo before heading off to their prom. Cooper’s own interest in the subject was first sparked when she chaperoned a prom in Philadelphia at the high school where her mom teaches, she said. “I grew up in the Philadelphia suburbs, where custom gowns and suits were virtually unheard of when it came to prom. Boys rented their tuxes and girls purchased gowns at specialty or department stores. But within the city, Hispanics and African-American teens going to prom wore and commissioned custom garments,” Cooper said. This experience led her to wonder if the same type of spectacle existed in Chicago and in what parts or demographics. 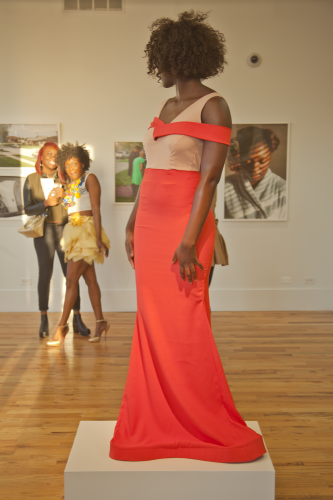 After a chance encounter with the owner of a textile outlet in Pilsen, she was pointed in the direction of Opara, who has been making prom gowns for about twenty-five or thirty young women every year. Opara, in turn, directed Cooper towards her clients, who opened their homes for Cooper to photograph the pre-prom events. Beginning from when her subjects, a majority of whom are from African-American communities across the South Side, start to get ready, to when they enter a car to go off to the main event, Cooper captures every moment in between. What she found was more than pomp and circumstance, but rather entire neighborhood affairs. Just as Cooper’s work began to find a sustained focus on the South Side, she and Opara began looking for space to jointly exhibit their work. When the Arts Incubator had a call for exhibition submissions, it seemed like the perfect venue, not only for its proximity to the greater South Side, but also in terms of the intended thematic discourse behind their work. “[The show] gives people of other cultures a look into something they wouldn’t normally see, especially a different image of African Americans, because with media you’re constantly bombarded with negative images of young African Americans,” Opara said. Yet, at the heart of the exhibit, of course, is the element of fashion: it is what first caught Cooper’s attention, and the designs are the most striking visuals in the show. As the eye travels around the room, it constantly catches on the vibrant, sequined, and elegantly embroidered pieces physically in the gallery, as well those worn in the pictures. At the opening in late March, a professional model wearing one of Opara’s designs even stood on a pedestal in the center of the room. Cooper’s photographs act as freeze-frames of moments of intense excitement; many depict large crowds with phones and cameras held in the air taking pictures of the prom couple. Cooper herself becomes as much a part of that crowd with her camera as she is separated from it as a third-party observer. “I believe [prom] was adopted as a marker for coming of age. For families it’s a symbol of pride, you have to finish high school to go to the prom, and it signifies an accomplishment—it’s a big deal—the whole block comes out, both families come out, some families have T-shirts made, there are make-up artists, balloons, and just so many little details,” Cooper said. While prom remains the connecting factor between Opara and Cooper’s work and the thematic focus of the exhibition, neither the dresses nor the photographs would exist without the event itself. They exist as mere documentation, even relics, of the actual event, which transcends the work and remains as separated from the viewer as from Cooper and Opara, neither of whom ever attend the prom. They amplify our consideration of what it means for a whole community to gather around this singular event. “There are so many different types of families and communities and support, and when hundreds of people come out every year to see someone off to their prom, that’s really what it’s about,” Opara says. With thousands of students graduating high school and attending prom in Chicago every year, there is no foreseeable shortage of subjects for Cooper’s photography, and certainly no decrease in the number of commissions that Opara is likely to receive for her one-of-a-kind pieces. The two plan to continue their partnership, as well as their individual work. Opara is already having multiple fittings a day for dresses, while Cooper has plans to photograph the upcoming season. With new families, new dresses, and new events to be experienced, it is of great importance that Opara and Cooper are willing to share with the public such an intimate window into prom and the beauty and celebration that comes along with it. Thank you Emiliano for such an accurate write up!